Twelve families have taken up residence in the latest homes to be built as part of Bolsover’s first council house building programme in a generation. 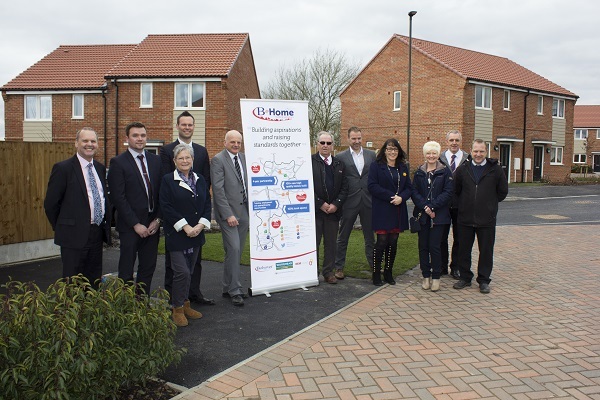 The B@Home Partnership, set up by Bolsover District Council, contractor Woodhead Living and procurement consortium EEM Ltd, has so far seen 33 homes built across the district. The latest 12 two bedroom family homes on Derwent Drive in Tibshelf, are providing much-needed family housing to local people. The energy efficient properties are built with a ‘fabric first’ approach, which means each home is well insulated, secure, warm, modern and built to last. Bolsover District Council Deputy Leader, Councillor Mary Dooley said, “It’s always a pleasure to meet up with the families who will benefit from our new housing stock. Throughout the project, Woodhead Living’s site team has engaged as much as possible with the local community. From working with Tibshelf School to offer ten pupils work experience places, to taking on a local lad through a Traineeship programme, and offering him a full-time apprenticeship, to taking a group of school pupils on site visits, the project has enabled Woodhead to get involved with local construction workers of the future. Tibshelf School students also built 20 bird boxes and tables, which have been installed around the site to encourage local wildlife to return to the development. Woodhead has also worked with 19 local sub contractors, keeping 95% of its business from within 40 miles of the site, and buying 81% of its materials from within a 20 mile radius.